Elizabeth spent her youth at Hope End, near Great Malvern. While still a child she showed her gift, and her father published 50 copies of a juvenile epic, on the Battle of Marathon. She was educated at home, but owed her profound knowledge of the Greek language and much mental stimulus to her early friendship with the blind scholar, Hugh Stuart Boyd, who was a neighbour. In her early teens, Elizabeth contracted a lung complaint, possibly tuberculosis, although the exact nature has been the subject of much speculation, and was treated as an invalid by her parents. For a girl of that time, she was well-educated, having been allowed to attend lessons with her brother’s tutor. She published her first poem, anonymously, at the age of fourteen. In 1826 she published anonymously An Essay on Mind and Other Poems. 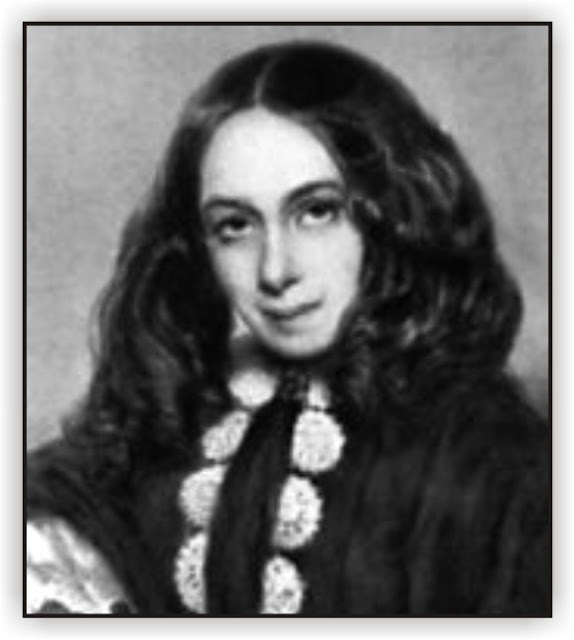 Browning is generally considered the greatest of English poetesses. Her works are full of tender and delicate, but also of strong and deep, thought. Her own sufferings, combined with her moral and intellectual strength, made her the champion of the suffering and oppressed wherever she found them. Her gift was essentially lyrical, though much of her work was not so in form. Her weak points are the lack of compression, an occasional somewhat obtrusive mannerism, and frequent failure both in metre and rhyme. Though not nearly the equal of her husband in force of intellect and the higher qualities of the poet, her works had, as might be expected on a comparison of their respective subjects and styles, a much earlier and wider acceptance with the general public. Mrs. Browning was a woman of singular nobility and charm, and though not beautiful, was remarkably attractive. Mary Russell Mitford thus describes her as a young woman: “A slight, delicate figure, with a shower of dark curls falling on each side of a most expressive face; large, tender eyes, richly fringed by dark eyelashes, and a smile like a sunbeam.” Anne Thackeray Ritchie described her as: “Very small and brown” with big, exotic eyes and an overgenerous mouth. The Battle of Marathon, c. 1818 (age 12). “The Rose and Zephyr,” first published work, appears in 1825 Literary Gazette. Poems (includes the Sonnets from the Portuguese), 1850.